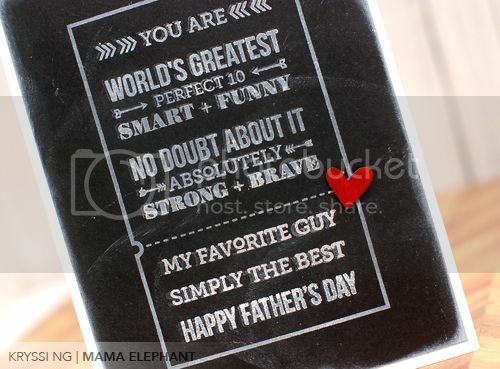 Ah, today I get to show you Papa Love, a very hip and trendy sentiment based set that covers all the guys in your life. We really pondered about this one, masculine cards and images are always a little challenging... it seems like everything's been done before. We wanted to make sure we create a set that you will reach for again and again and again! I think you'll really like this nonconventional dad/dude set. After all, we make stuff not just for the ladies but for the men in our lives too! Papa Love will be available for purchase on March 15th. Papa Love comes in a 4x6 clear acetate sheet and will retail for $15.00. Papa Love contains a total of 14 stamps: 4 images images and 10 sentiment stamps. The ticket frame stamp measures 2-1/2"x4". The sentiments measures about 2" wide. The diameter of the circle stamp measures about 1-1/8". I resisted the chalkboard craze for as long as possible, until the right stamps came along... how convenient for us because Papa Love is the perfect set to try your hand at that cool look! It didn't even take much effort, but here is my card. It's so much easier than it looks. First I stamped everything with Versamark ink and heat embossed with white embossing powder. Tip: Work fast because the Versamark dries! After everything was embossed, I inked everything up again with a white pigment ink and stamped directly over the embossed images again. I didn't line everything up perfectly, shifting to the left a smidgen to give it a chalk shadow. When I was done with all the stamping, I took a white inkpad and directly swiped the edges of the card and little over it to get that messy chalked over look. Finally, a little wooden heart colored in with red Copic markers finished the card. And there you go! 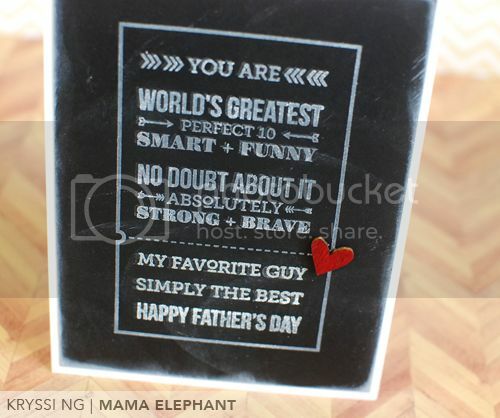 A super stylish way cool card with just the right amount of sweet for dad!!! Love your shadow look with the double stamping!!! LOVE this card!!! and thanks for the mini tutorial too! love that!! this set seems to be just perfection for dudes!! i can't wait to see it in it's entirety! I am really looking forward to the full reveal of this set! LOOOOOOOOOOOOVE this! 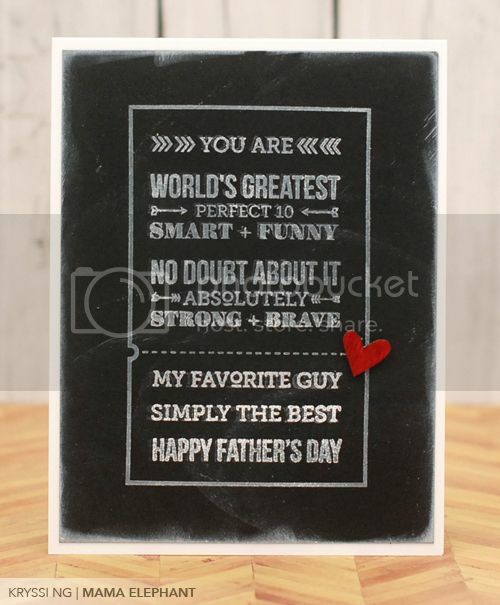 This is a great card using the chalkboard technique-- LOVE that little heart! !